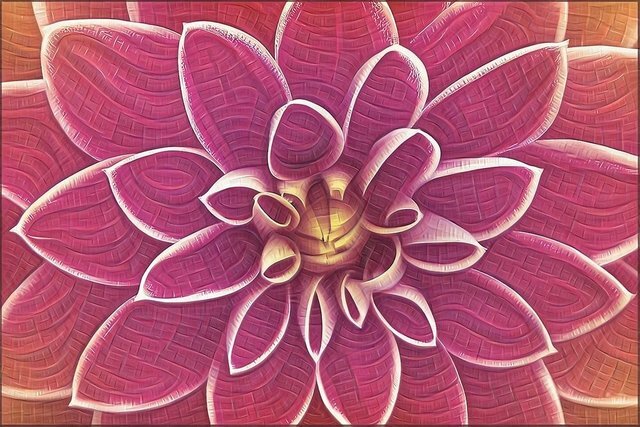 This design features...a vibrant pink flower with glowing center and outstretched petals in full bloom fading outwards into purple, red and orange. Matching qualities that carry through the whole abstract artwork collection include whimsical stylized strokes...depth and detail with distinctive swirling texture...bold contrast between individual elements and an overall modern and artistically painted appearance. 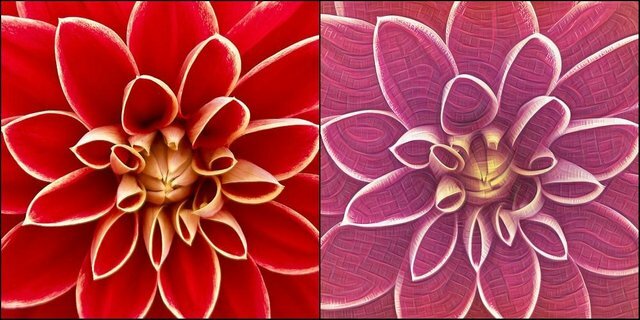 This series showcases 'before and after' snapshots of digital artwork transformations that started with public domain pictures and other free to use stock images. The process of photo manipulation itself and merging my own artistic vision with ai assisted technology...neural networks and other state of the art tools and techniques enables the creation of designs that emerge entirely unique from the source material...and with a lot of character. I have also used professional software to upscale these graphics into superior resolutions perfect for printing on custom products. You can support me by purchasing a high quality printed product with this daily digital design through my "HelloAbstract" redbubble account. To encourage more engagement and also give something lasting towards the growth of this community...I will be sending out some steem basic income shares every week. The amount fully depends on how much these posts earn. A minimum of one share will be awarded each week with the sky as the limit. This is meant to be very open ended...so say anything you like! But your comment should be something relatively interesting and conversational that you put some thought into writing. Maybe tell me what you think about today's design...or write something creative inspired from it. You are welcome to leave a different comment on every new post to earn multiple entries and more chances to win free upvotes for life. To be eligible to win some sbi shares...the only thing that you need to do is leave a thoughtful comment. Upvotes and resteems are optional but very much appreciated. Receiving a 10% upvote means that you have been entered in the next weekly draw. This is lovely and doesn't necessarily have to be a flower as on the digital version it almost looks looks like a ray or beam of light trying to be seen behind the purple clouds, perhaps the sun trying to push past the clouds.